$169 per person. Minimum 4 Persons. 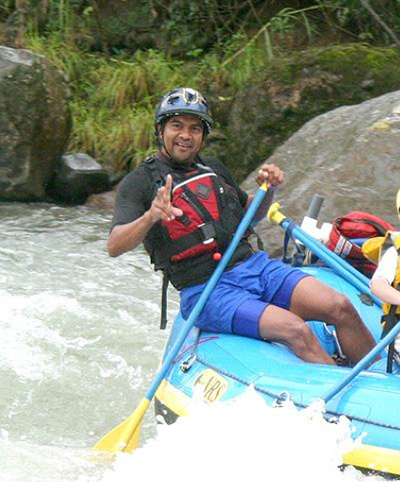 Your guide has been down the Pacuare River countless times. Each time looks and feels different. The river is alive with its height and speed. Of course the river has been there for thousands of years, but in a sense your encounter with her will be unique. Your guide will be in tune with the river’s personality that very day, take a somewhat different line and guide you to paddle to match the conditions. It is truly an expedition, a unique adventure. After a thrilling stretch-perhaps one of the most exciting experiences you’ve ever had- the river goes through a serene stretch which feels like it’s rewarding you for paddling. It gives you a welcome rest, a chance to loaf and talk about the wildlife on the shores. Your shoulders relax, you feel the sun on your face, and enjoy the serenity. You can even get out of the boat and enjoy floating which will make you feel part of nature in another way. And then back to the excitement. The experience is unlike a roller coaster ride. Instead, it’s organic and flowing (in both senses). You feel in some sense a part of nature as the river moves you inexorably forward, yet you experience yourself and your raft in control, in harmony. You may experience a quickening of pulse and a rush of anticipation as the adrenaline increases, enjoy it...we have taken every precaution to safeguard your experience. The rafts themselves cushion you, the life jackets have high flotation, the safety kayak is always there with your boat and if the river rises to unsafe levels, they always have a way planned out. Nature provides a safety factor too...In some parts of the world, river water is very cold, almost freezing. In the Pacuare river, the water is a pleasant 70 degrees Farenheit. 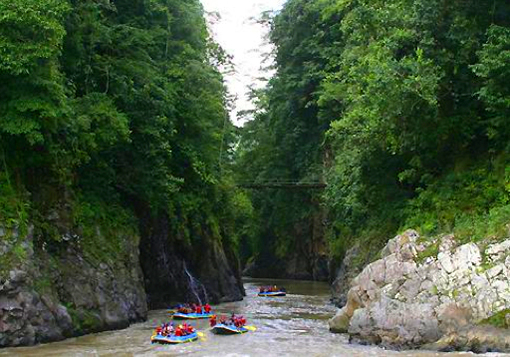 The Pacuare Canyon has exhilarating Class III-IV rapids and guests from 12-87 years old have comfortably had this adventure with us. 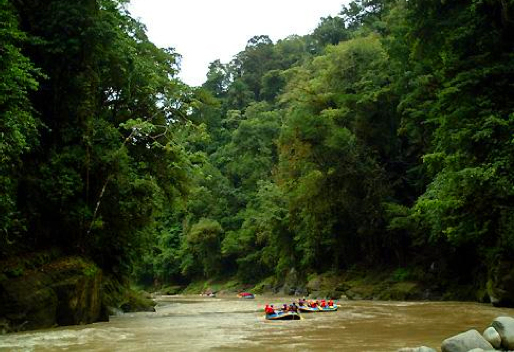 In the 32 years since Costa Rica Expeditions’ founder and CEO, Michael Kaye, first brought tourists to this river, the company has never had a fatality. Many grew up near this amazing river, playing in it as children. Many had a brother, or cousin or father who was a guide. Many have over a decade of experience with us. They fell in love with working in this natural paradise, and they’ll share with you the history of the Pacuare and the culture of the people of the mountainous Turrialba region. A few of our guides have become white water kayaking competitors, participating in competitions both in Costa Rica and around the world. All of them have first aid, CPR and Swift Water Rescue Technician certification. Some are instructors of these activities, and Red Cross volunteers. They love to work with other guides as a team. They all speak both English and Spanish. We also selected those who love to take care of guests, to share their knowledge and stories of wildlife and of Costa Rican culture. They also prepare for you an amazing river-side banquet lunch. They do what it takes to create lifetime memories. Our guides are simply the best of the best. What makes a lifetime memory? The whole-body experience of flowing through beautiful and dynamic nature is unique. Perhaps skiing comes closest to the feeling, but in white water rafting you have the additional element of sharing control with nature as you’re swept along. Why pick the Connoisseur Whitewater Expedition vs. the Ordinary one? 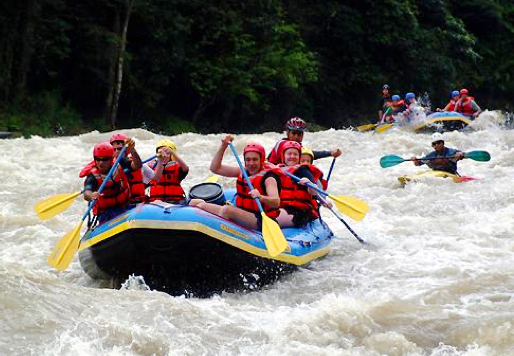 Ordinary White Water operations are not run by Costa Rica Expeditions and operate at an entirely different quality level. If you ask us to book you with them to save money, we pick the safest of the 12 companies to protect you. We know who they are because our guides talk with their guides, we know the guides they hire. At one point none of the rafting companies satisfied our criteria, and we stopped booking our guests with any of them, running our operations at a loss. Our equipment is not only modern and in good shape, it looks that way! That’s important because you want everyone in your party to be comfortable and confident about your trip. Then there are the subtle but important things we attend to that might only be noticed by an experienced guide, such as whether the life vests have lost their buoyancy. We are mobilized about all those things, and monitor them continuously. With those Ordinary operations, you sacrifice many hours of your time as buses pick up as many as 150 people, making stops at as many as 8 hotels where you wait at each. It can be pretty chaotic, more like herded than guided. With those mass operations, you may have one “transfer guide” brief you on the bus, and another rafting guide on the river. Over the years we’ve learned that they would much rather curl up and go to sleep on the bus, or catch up on the latest with the driver than interact with their guests. On our Connoisseur Rafting experiences, you have the personal connection that causes many people to feel that they know the guide and that he’s become a new friend. With us, you’re in a conversation; with all the Q&A you want. So, those Ordinary rafting providers take a lot of your time, and that ignores that your vacation time is precious. With all their picks ups at the downtown hotels, they tend to get to the river late. We pick you up early so that you can be the first on the river, before there are a lot of people and rafts milling around. You’ll have plenty of time to get your life vest on, get fully briefed including emphasis of what’s really important, and have no sense of rush. With us it’s designed to be relaxing. With us, your guide doesn’t just listen; he watches eyes and body language to detect any confusions or misgivings. His goal is not only to have you be comfortable, but for you and your loved ones to feel totally at ease. He wants to be sure you not only know what’s important but why, so you’re able to do what’s needed with ease. Your little group, with no more than three rafts will have the river to yourself until your banquet lunch. That way, you really experience the pristine wilderness, and have a sense of discovery. You totally avoid the sense of a “theme park” with a train of as many as 25 rafts, with lots of noise and confusion. The experience we give you of being alonge on the river is part of what makes a lifetime memory. Because you have a small party, we can pamper you at our river buffet banquet. Some of our guests call our approach “white glove service” your guides actually wear chefs hats and aprons. 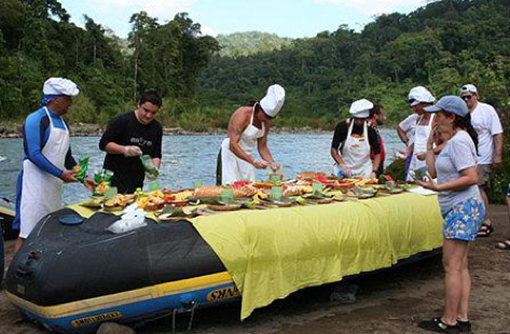 With the Ordinary rafting trip you have a cafeteria style lunch at the take out, but when you choose the Connoissuer rafting expedition, we take the time to picnic on the bank of the Pacuare River. Your guides will transform from rafting guides to White Gloved Waiters and serve lunch on an upside down raft. Our guides are the best of the best. We pay twice as much as the other companies. Indeed, our guides know the river best, in all its moods-through any line they might want to guide the boat. They have the knowledge, skills and assertiveness to even stop going down the river if the water rises and looks like it might get out of hand. You might not even notice if the river level is rising, because you have no fixed reference, but they have the skill and can see if the level has risen significantly. They know where all the evacuation routes are. They’re trained, and have integrity, to resist client pressure if they think it might become anything but fully safe. Guests sometimes feel courageous about it, and can put pressure on the guide saying things like “I’ll take full responsibility, we’ve rafted X, Y & Z, and this is the highlight of our trip; so you can’t have us walk out. Our guides are trained and experienced at resisting such pressure. Because they’re so experienced, they can spot people on the bus or at put-in who should not g because they’re scared and are for example are being pushed into it by a spouse. They can spot when a child is too young or not capable or confident enough. All that helps explain why, in our entire history, 32 years on the river, we’ve never had a fatality. In fact, we haven’t had more than a dozen accidents’ that required a doctor’s attention, which is only about one every 3 years on average! Most accidents are a simple bump or bruise, of the sort you might get anywhere in an active life. The tables below give you a recap of the contrast between our Connoisseur White Water One Day Expeditions and Multi-Day Expeditions, and the Ordinary tours run by other companies. Since the White Water experience is one that so many people rave about as the highlight of their vacation, we think it’s worth the additional expense to have the greater safety, experienced guides with fascinating stories and information-the experience of being in touch with nature, elegant meals, personal connection with guides, and many hours saved. Who operates it Run totally by us. All equipment owned and maintained to highest standards by us. The best 2 out of 12 contractors we hand pick for safety. Guides Our extremely experienced guides. Experience varies. Safety Kayaks Always with your small group. ***May have one Kayak for up to 25 rafts. Max rafts / people Maximum of 3 rafts. No more than 18 people. A “train” of as many as 25 rafts. As many as 150 people. Wait time for pickup No other client pick-ups, designed to get to the put- in before other rafting operations, and spend as much time as possible on the river, not on the bus. As many as 8 hotel pickups. Wait time can be 30 - 120 min. Hike up a creek leading into Pacuare Water level permitting have this adventure, returning to find your gourmet lunch waiting. None. Meals Includes Costa Rican style breakfast at a place where no other company stops. Riverbank gourmet lunch buffet (see Rafting Menu above) and photo CD of your trip. Standard restaurant breakfast. Cafeteria-style meal at end of tour. Safety talk and orientation At the put in, and given your small group, plenty of time to ask questions. ***In their bus. Extras Photo CD including ***, fresh towels, victory cocktail at take out. CD sold for $35 extra.